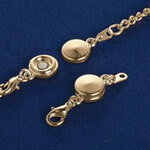 Snap shut clasps are magnets with the magnetic jewelry clasp! 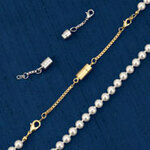 No more fumbling with tiny screws or hooks; no help needed to fasten jewelry. Hook spring rings onto necklace ends, then onto clasp. Replace tiny, hard-to-manage clasps in seconds. Set has 4 spring rings and 2 sturdy magnetic clasp sets. Locking magnetic jewelry clasps easily fasten to existing ones and stay put, thanks to their specially designed interlocking ridges. Set of 4 locking clasps. 70% alloy/25% iron/5% magnet.